Ted Davis observes in the Introduction that the year may be best remembered for the Nike v. Already case, which featured the issuance of a writ of certioriari by the Supreme Court’s in a trademark case for the first time in nearly a decade. On the TTAB front, perhaps most notable was the surge of dilution-by-blurring cses that caught the Board's attention, making up for its recent lack of interest in anything having to do with fraud. 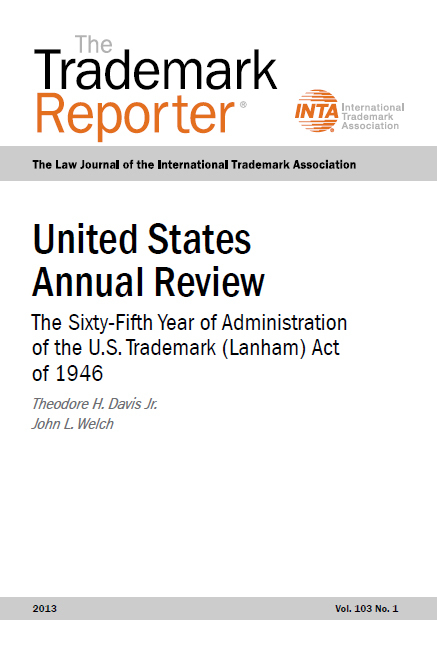 TTABlog note: Thanks again to The Trademark Reporter for granting permission to provide a link to this issue, which is Copyright © 2013 the International Trademark Association and reprinted with permission from The Trademark Reporter®, 103 TMR 1 (January-February 2013).